This week's writing challenge from Five Sentence Fiction ( Lillie McFerrin Writes ) is based upon the prompt "Ringing." Before I get to the story, I wanted to make note of a change in the blog. I've removed my sidebar gadget, Other Writer's Blogs and Web Sites, and replaced it with a new and improved page for the same purpose, a link to which can also be found in the list of Pages, also on the sidebar. The new format allows me to put additional information in an easier-to-modify format. Please check this out - you might even find yourself there! 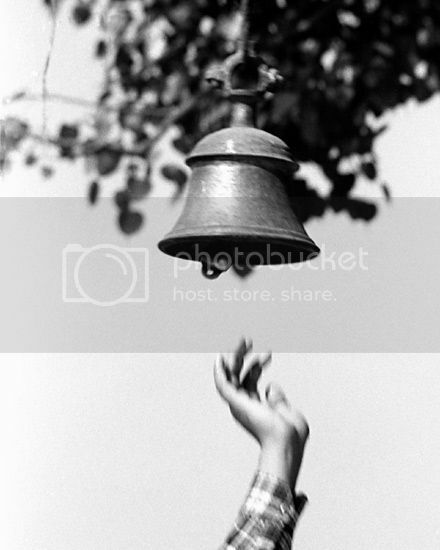 The tarnished brass bell, somehow still clinging to the hanger on its weathered post, was all that remained of the quaint rural schoolhouse where he had gained the first six years of his formal education. It was a curiously comforting anachronism, a stoic sentinel standing guard against the encroaching chaos of the world, protecting him as he surveyed what was left of his past. There, behind where the old frame building once stood, was a single beech, little more than a sapling in his memories, now spreading its coppery autumn canopy over the low stone wall were he sat next to a girl for the very first time owing to no other reason than he thought she was pretty. Sitting there once again, he could hear the bell faintly ringing, calling them back to class, her freckled face smiling as they ran to the door side-by-side, the curls of her soft hair, nearly the same hue as the leaves on the old beech, bouncing with every step until their toes touched the threshold together. As a chill breeze stirred, she faded away along with the ethereal white building leaving him to ponder how much had changed, and how much he had changed, yet knowing everything of importance, everything he truly valued, had roots in this humble half-acre. What a fine memory you have captured with your words, KR. This was really nice, a read that made me smile in understanding of the effect our beginnings have upon our lives. Childhood was so much simpler back then! Thanks! One of the few good things about being older is having real memories of places like this. Yes, it was simpler back then - and we managed to survive without cell phones, PCs, the Internet, and in the case of my grandparents, electricity or indoor "facilities" - I have real-life experience using the chamber pot from under the bed on cold winter nights! (Sorry if that's TMI). Very nicely written story, very visual and nostalgic. Thanks! I'm a little slow at responding to the comments, but I always read them and appreciate that someone took the time to read my little stories and make a comment. I also had 2 rescued cats, only left with one now. Thanks! It seems that many people just want to move on to the next thing in their life and forget about where they came from. By the time they're mature enough to understand the significance, it's lost. Lizzie Loodles? Now that's got to be a story in itself! Very nice, K R! I was swept right in and moved by the story. Thanks! Five sentences doesn't give much room for being descriptive, but I'm trying to work with it to see how well I can paint an image within those bounds. I'm glad you liked it! Now I have to find the time to read everyone else's stories! Wow. Excellent description. Made everything vivid. Well done! Thanks! That's the first time I've ever gotten a "wow." A lovely story beautifully written - definitely worthy of the wow! Thanks, but now I've set the bar too high... people will be expecting me to write passible prose all the time! What haveI gotten myself into?